Early and accurate identification of hearing loss is critical. Normal speech and language development is probable. Fitting of hearing aids before 6 months of age provides better speech/language outcomes. 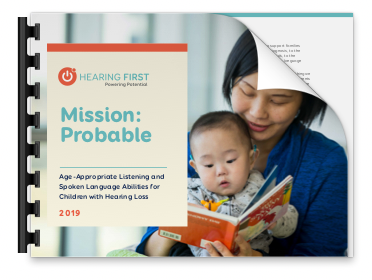 Cochlear implantation before 12 months of age provides better outcomes- Consider cochlear implantation for severity of hearing loss of 70-75 dB HL and poorer. 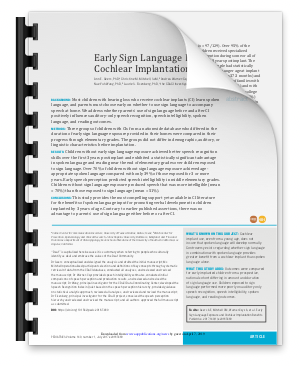 Hearing aids and cochlear implants must be fitted appropriately to optimize outcome. The use of prescriptive targets is recommended upon verification of hearing aid function. Children who wore their hearing aids 10 hours a day by age 5 had optimal language outcomes. Hearing aids and CIs must be worn during all waking hours to optimize outcomes. Children who are hard of hearing do not hear as well in noise. It is recommended to utilize additional technology such as remote microphone, adaptive directional microphone etc. Disabilities associated with developmental delay and or low nonverbal IQ negatively influence outcomes. If additional disabilities are present, it is important to access community resources to optimize outcomes. Intensive language therapy is recommended.